Audax K.C. is the home for long-distance, non-competitive bicycling in Kansas City and the official site for ACP and RUSA-sanctioned rides for the Kansas City region. Randonneuring is self-supported long-distance cycling. It's a great sport for those who love to ride their bikes, explore new roads, and discover what is over the next hill. Our rides are scenic and challenging. Perhaps most enjoyable is the camaraderie among randonneurs. Randonneuring is not a race, but the time limits create a worthy challenge. Randonneuring celebrates self-sufficiency. On a brevet or a permanent, you are on your own ride. The self-sufficiency of randonneuring means that you are responsible for your own pace, your own nutrition, your own repairs, and, above all, your own safety. Although other riders, or the organizers, may offer assistance the ultimate responsibility lies with you. We are each on our own, personal ride on public roads and should be visible, safe, predictable, and courteous to other road users at all times. Randonneuring is a big tent where every rider finds their challenge. Some aspire to finish within the time limit, others try to set a personal best. Some concentrate on the longest distances (1000 km and beyond), others do the day rides (100, 200 and 300 km). Some ride only gravel, some only pavement, some enjoy a mix of both. Some riders crave the latest tech and carbon fiber frames, others prefer vintage steel or fixed-gear drivetrains. All are randonneurs, and Audax K.C. respects all of these riders. We are all out to have fun and enjoy the ride! Randonneuring rides (called populaires or brevets) vary in length between 100 km (62 miles) and 1,200 km (750 miles). Riders are given a route (cue) sheet and a control card, which they have signed at predetermined points to show that they have completed the course. Audax KC has no membership dues: We welcome all riders! If medals or awards are sought, RUSA membership becomes a requirement, which starts at $25/yr. See the RUSA webpage for membership details. Riders interested in permanents must have a current RUSA membership to ride for credit. RUSA membership is a great value and is national in coverage, allowing riders to travel the country and ride a myriad of events with different clubs, all towards mileage awards! Click HERE to join RUSA! For upcoming Audax KC ride information, see the Audax KC Ride Calendar on this website. Clicking on each ride date expands to reveal full details on each event such as start location, maps & cues, parking info and other applicable information, plus a link for pre-registration. Finally, to stay informed about our events, please join our email list. The link below takes you directly to the Audax KC Ride calendar: click on each entry to see info, cue sheet, GPS map link, and start location. We're fortunate to have a lot of local riders who have ridden at the 1,200km level with both frequency and success - Feel free to email him with interest and/or questions on P-B-P, and to find out who else you can chat with in our club! 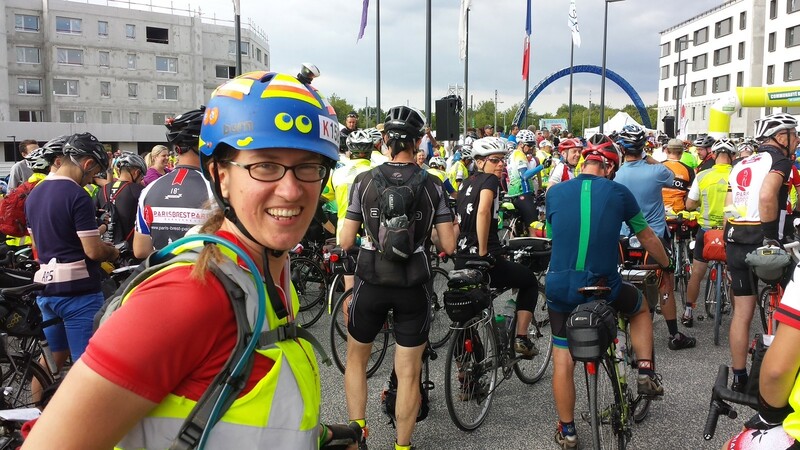 Photos from Rebecca's 2015 Paris-Brest-Paris adventure! Spencer has been forwarding these emails to the Audax KC forum email list, but, you can find a full list and more using the link below - this is a Google Groups list, so you may need to have a gmail account, or subscribe to read the content. Randon is a good list if you're a randonneur anyways. More to come -- watch this space! It is the responsibility of ALL RIDERS participating in Audax K.C., ACP, and RUSA sanctioned events or any RUSA permanents to read, know, understand and practice the RUSA Rules. Refer to the RUSA Rules link below. Rules are event-specific. Read them carefully. RUSA rules, common-sense, and the rules of the roads on-which we ride will be enforced during our events - no exceptions! § Make your rides "count"! Earn Awards! § RUSA's American Randonneur magazine! § RUSA Membership only $25/year! √ 4] Mail your completed registration & check to . . . The Audax KC community has a vast catalog of Permanent routes for you to enjoy. Check out RUSA's Permanent Search page to find one near you! Remember: Current RUSA membership and pre-registration with route owner is required to ride any KC-area Permanent - before embarking on a Permanent, you should be familiar with brevets and procedure. See RUSA's webpage to find a route near you, and contact the route owner with enough notice to allow discussion and set-up of your ride. Note: while any RUSA member may develop their own permanent route, we ask that you consider working with the RBA during your development. Since RUSA's route approval process involves the RBA for any area through which your ride may pass, this will help save you some steps along the way and will give you some tools to help create a solid route. Thank you! Like any other event, volunteers make it happen. If you, or anyone you know, have an interest in helping make our brevets a success PLEASE contact our RBA, Spencer Klaassen. 1. (The easiest!) Be an ambassador - tell your cycling friends about randonneuring! ACP supplies medals for ACP-validated Brevets. These are available in the U. S. for members of RUSA. There is a specific medal for each distance (200, 300, 400, 600, & 1000 KM). For each distance, the medals' design is similar but distinct to create a “family” of medals. The same design is kept for four years and a new design is introduced in the new season after each PBP. It is worth buying a complete set of medals, one for each distance, every four years. 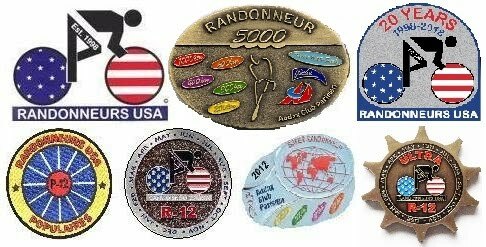 There are also special RUSA medals for different distances and groups of rides - visit www.RUSA.org and look under "Medals" for more details. The routes represented by cue sheet, map, web-page or navigation data file on this website were submitted by riders like you. Audax KC makes no representations or guarantees as to the accuracy of the cue sheets/maps/navigation data or to the practicality or safety of following/riding the routes represented by each. Routes posted here were composed based on the best available data at the time of their creation. Your exact mileage may (and likely will) vary. The routes generally follow regular, public-access roads used by automobiles and trucks: these roads may have no special provisions for bicycling. Road conditions may have changed since the route was created; road signs may disappear or become turned, blown or knocked down; departments of transportation may rename or remove roads; road conditions may improve or deteriorate; bridges may be reconstructed, closed or moved; roads may be made one-way; construction may exist; natural concerns like flooding, downed trees or residual snow may block a road; there may be varying degrees of gravel, sand, ruts, washouts, or low-water-crossings; gas stations and stores may close, relocate or change operating hours; housing developments or businesses may develop; traffic densities may change; and, all of these may be affected by weather and/or time of day. 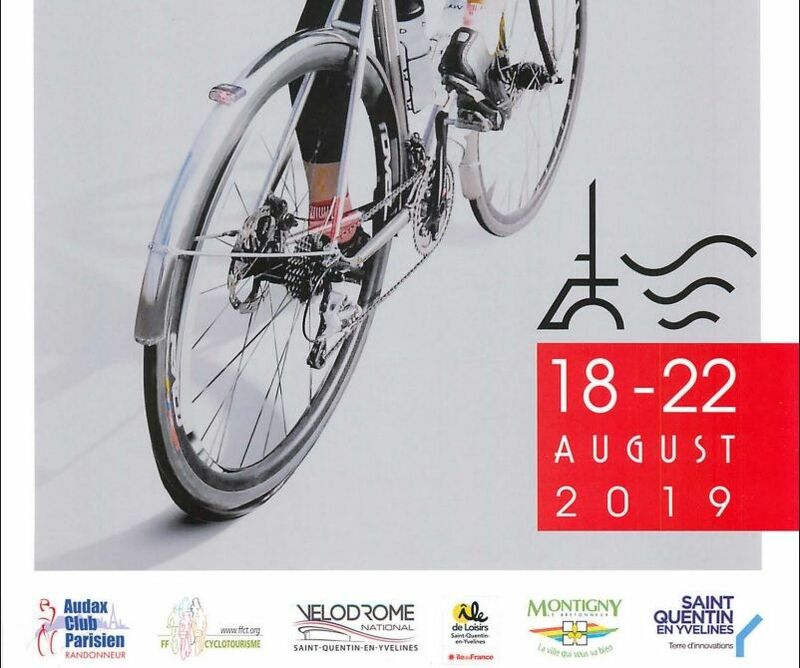 At organized and sanctioned brevets, all known route issues will be announced at the rider's briefing immediately prior to the start time of that event. Being on-time for events is critical for receipt of this information, as well as a courtesy to your organizers and event staff. Persons should possess adequate cycling skills, be knowledgeable of vehicular & traffic laws, and be able to obey the rules of the road at all times before attempting to follow any of these routes. Persons following any of the routes represented on this website, or following routes based on cue sheets, maps, or navigation data presented upon registration for/at a Audax KC event, assume all risks for their own personal safety, health and well-being, and assume all risks with regards to equipment including their human-powered vehicle, anything that attaches to it, anything worn or used by the rider during the course of the event, as well as transportation to and from the event start/finish location, and agree not to hold Audax KC or any of its members or contributors legally liable for any loss, inconvenience, injury or damage that might occur. Regardless of any guise of organization, all riders (including non-members) that follow any of the routes/maps/navigation data listed here or distributed by our members are considered to be embarking on a personal ride and agree to the above. Every rider on every ride will be required to sign a liability release form. These will be provided at the start of each event. From the Open Road . . .
© 2008-2019 Audax-KC, K.C.Ultra-Cycling ............ Powered by Blogger. Join the Audax KC Email List! The best way to stay informed about upcoming events is to join our email list - subscribe below! If you don't see rides listed above right away, click the Look for more link in the calendar! 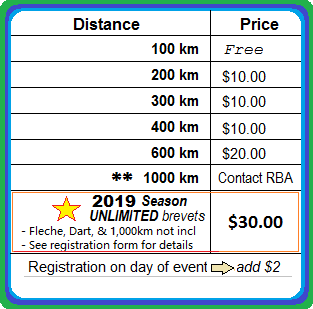 Click on any event listed in the calendar above to view its details, including start location and map, cue sheet and route map links, parking details (if applicable) and pre-registration link. Click on the event title again to minimize. For a Mobile Device view - click here! Contact the RBA to pre-register and save! Disclaimer: We are cyclists, not social media gurus. While we will do our best to post information about upcoming rides and the like, the main source for information continues to be our email list. For the most consistent and timely event information, please join our email list also! R-12 and P-12 Explorer Awards! The P-12E and R-12E are not official RUSA awards, but are designed to entice riders already pursuing the RUSA R-12 and RUSA P-12 awards to add some variety to their riding. These are administered by your RBA and are awarded upon successful completion of either the RUSA R-12 or P-12 requirements, with the added challenge of completing a DIFFERENT route for each of the 12 months for a "no-repeat" year-rounder! Contact the RBA for details! Do I Need Reflective Gear? To aid in planning, Civil Twilight times have always served as a good guideline for what to bring when you're not sure what conditions might be like when you start or finish a ride; check it out here. · Is it especially overcast? · Is the sun in front of me? · Can they see me? We are on public roads and on our own ride at every Audax K.C. event and are ultimately responsible for our own safety. Be visible, safe, predictable, and courteous! KS: Anderson Co. Road Dept. KS: Coffey Co. Highway Dept. KS: Morris Co. road dept. In addition to the permanents listed above, our RBA has created several "Free-Route" Permanents that challenge you to bicycle between the state capitals around our region of the country! This is an exciting way to earn RUSA mileage credit and explore the area's rich local history along the way. There are MANY versions - Contact your RBA, Spencer Klaassen, for details and see if there is a route that interests you. Webpage designed and hosted on Blogger.com.